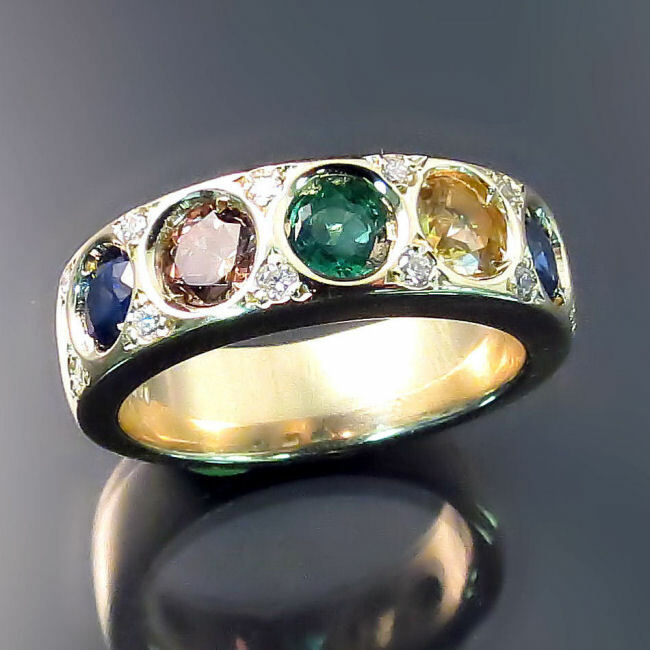 Custom jewellery is our specialty at Zoran Designs. Our jewellery designer can help you create a unique, one of a kind piece you'll treasure for life. From custom engagement rings to family jewellery, pendants and earrings, we can help you turn your bespoke jewellery vision into reality. Custom jeweller located in Hamilton Ontario; serving Burlington, Oakville, Mississauga, Toronto, the GTA, Niagara and beyond. The custom design process is an exciting one as it allows us to work together with you and exercise creativity to make something truly special. 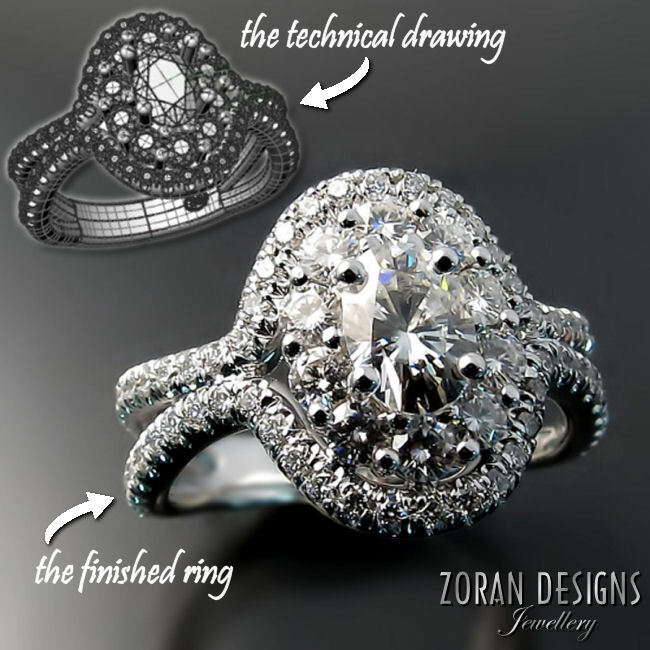 At Zoran Designs Jewellery we listen to our clients, inform, and provide ideas and alternatives. We approach each custom design project as a collaborative effort and never try to force the client in a direction they may be uncomfortable with. The decisions are always made by you and there are never any unpleasant surprises. Bespoke two tone gold ring with diamonds. Watch the custom jewellery design process. Zoran Designs is your Hamilton GTA custom jeweller. Zoran Designs is a second generation jeweller specializing in exquisite, one-of-a-kind and custom made jewellery. Whether you already have an idea in mind or want something designed "from scratch", we will be happy to discuss your options with you. We design and create custom engagement rings, wedding bands, family and birthstone jewellery, personalized pieces, and other jewellery for special occasions and meaningful gifts. Click on the jewellery photos below for more about each custom design. From traditional to modern and everything in between... we can help take your engagement ring design desires from concept to "Wow!". Follow the link at the bottom of this page to view more of our made-to-order and custom made engagement rings. Click on the images below for details about each of these commissioned, bespoke pieces and see how they came to be. I was commissioned by a client to help make his dream wedding band into reality. In this case, the customer had a defined idea of what he wanted and after discussing specifics and producing a rough sketch I got the go ahead. The next step can vary depending on design. Sometimes we go straight to wax (carving it by hand) but in this case we did a CAD (Computer Aided Design) rendering. After that the wax model was made and used to cast the ring in 14K yellow gold. The ring was then buffed, polished and set. The final result was this stunning custom made wedding band featuring two rows of diamonds in 14K yellow gold. Custom ring - from concept to "Wow!" Our services include expertly performed repairs and restoration of your fine jewellery, heirlooms and antique pieces. The pictured ring was an inherited antique that had been passed down for several generations and was being worn as an engagement ring. However, the original diamond had been lost, one of the accent blue sapphires was missing and all the stone settings were badly worn and damaged. We performed a complete restoration job that brought this vintage ring back to new condition and has ensured the piece will be enjoyed as an engagement ring for a long time to come. This vintage ring needed a lot of work to make it like new again. We replaced the thinned out shank with a new, thicker band, rebuilt and re-tipped all the prongs, supplied and set a new centre diamond and refinished the ring to new condition. What was once a worn out heirloom now has new life as a pretty engagement ring. Personalized jewellery is an ideal gift for life’s special occasions. Commemorate those milestone moments with quality custom jewellery they’ll cherish for life. This custom made name necklace is cast in 14K white gold and set with diamonds for a hit of sparkle. This personalized monogram necklace is made in 14K yellow gold. Specialty jewellery products and keepsake services such as setting your treasured gold coins. The pictured set shows gold coins that had been inherited and held great sentimental value for the family. We set them in coin frames so that they could be worn as pendants. Custom design exquisite family jewellery with Zoran Designs. 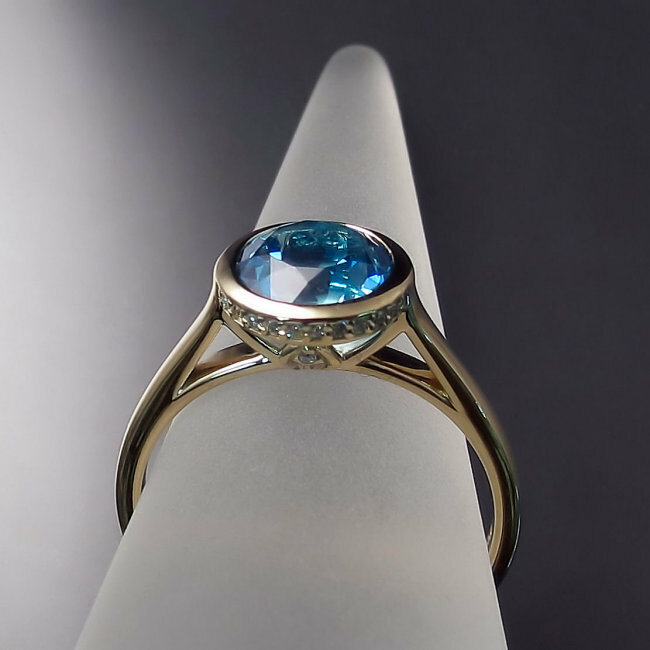 Whether you're looking to have a family ring made or a pendant representing your children's birthstones, contact Zoran Designs in Hamilton for your custom design needs.